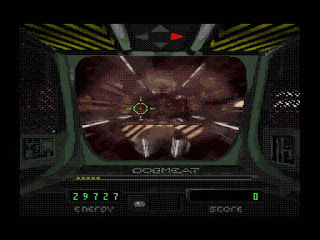 Sewer Shark is a first-person rail-shooter that was later ported to the Panasonic 3DO (1994). Piloting an Exterminator Class Sewer Shark vehicle, your job is to wipe out vermin that are running amok below Solar City. The A button fires your Gatling gun, B allows you to turn 90° at specific points, and C shoots hydrogen flares when your gauge is in the red. Energy can be topped up by visiting Recharge Stations, and you must also listen to your navigator who will call out numbers to guide you through the sewers (e.g. "3, 6, 12" correlates to Right, Down, Up). The gameplay has more depth than a typical shooter, as succeeding relies on you remembering the required co-ordinates to take the right path; it's similar to Simon Says and this deeper approach grows on you the more you play. The action is intense and there's always a non-stop onslaught of enemies to blast away using the responsive controls. A simple, yet clever mechanic is how some are deadlier than others and once you've learnt their specifics you can quickly monitor your surroundings and make split-second decisions on which ones to target first. I also really like how the later levels ditch the usual 'call-out' navigation and instead rely on you following a bird while firing off flares when the hydrogen level is red; it's challenging to memorise and multitask here (especially with Recharge Stations to find as well), but oh-so worth it when you do. The game's main weakness is its single life approach and lack of checkpoints which could switch players off; it's appalling that there's no way to continue your game until you reach a certain section 25 minutes into a 40 minute game, and even then, this is only achieved by entering a secret code after dying! Sewer Shark is a terrific shooter with surprising depth, and if you're looking for a game that adds a new twist to the genre you should definitely try this. As far as FMV games go, it's one of the best and it has just enough meat on its gameplay and story arch to keep you invested until the end credits. Random trivia: Sewer Shark was a launch title for the Sega CD console in North America.